Budding developments in the audiology field are always exciting to share with our patients and followers. Concept ideas alone often show great potential for the future, wherein technology will continue to play an instrumental role in helping individuals hear. Just a few months ago, a company called EarLens received FDA approval to introduce a new hearing aid bearing their name. This aid is particularly unique for one reason: it uses both eardrum vibration and – get this – lasers to amplify sound. The EarLens aid looks and, in part, works similarly to a behind-the-ear aid. 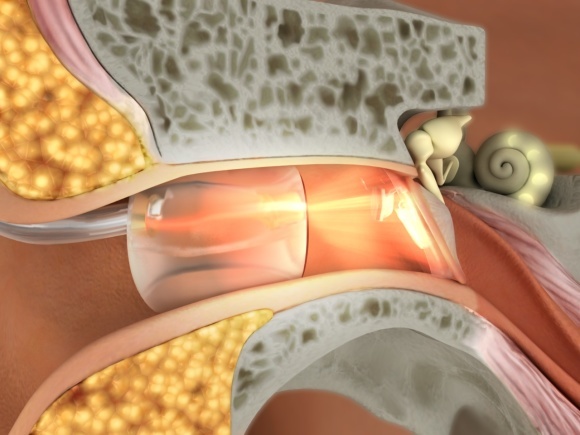 First, there is a transducer placed deep within the eardrum; this is customized to fit the user. The BTE processor then receives and converts sound waves into electronic signals which are then processed and amplified to be sent to the ear tip within the canal. Here is where the laser comes in: the signals are converted to “pulses of light [which] shine onto a photodetector in the TMT, which converts the light back into electronic signals, transmitting sound vibrations directly to the eardrum,” (Hearing Review). Check out this video for more details on the aid’s mechanics and functional capabilities. What separates the EarLens from typical hearing aids (other than the laser, of course) is that it uses light to amplify sound. It has tested to reveal a very high frequency range and improved clarity, especially in noisy environments, and its manufacturers boast little pesky feedback as well. As we settle into 2016, we can certainly look forward to other innovations in the hearing aid world.